Here’s more of my exchange with Bruce Richardson, Tea Master for the Boston Tea Party Ships & Museum. 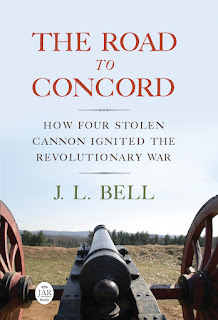 He’s coming to Boston to speak about “Five Teas that Launched a Revolution” at the Old South Meeting House on Thursday, 5 December. 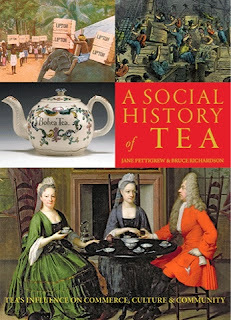 That event will also be the debut of the new expanded edition of Jane Pettigrew and Bruce’s book A Social History of Tea, originally published by the National Trust of Britain. Are there any common misconceptions about the tea involved in the Boston Tea Party? The visitor’s center at Monticello says the tea was in brick form. That’s not true. The English, and hence the Americans, had no taste for brick tea. See this blog post for more about tea bricks. Chocolate meant something very different in eighteenth-century cuisine from how we think of it today—it was a hot drink, not particularly sweet, and often for breakfast. Are there significant differences in the way people consumed tea between the 1770s and today? Did tea have a different symbolic or cultural connotation? In the stylish homes of Boston and throughout provincial America, the ritual of taking tea reenacted and reinforced the growth of an Anglo-American culture. But it was a culture based on a global circulation of goods. Tea drinking, often dispensed from specially designed tables, gathered together goods from around the globe–tea and porcelain from China, sugar from the Caribbean, sweetmeats flavored with spices from Indonesia, all arrayed on a Turkish carpet and served by an African slave to gentlemen and ladies dressed in fabrics from India and China. These Boston tea settings were similar to those found in the fine homes of London or Bath. The ensemble of objects might also have included Asian-modeled cane chairs and have been set off by Chinese-style wallpaper. Bostonians understood tea not as an exotic curiosity, but as one of the many global products that signaled their participation in a polite and worldly culture modeled after the lifestyles of their English cousins. Some museums in Boston contain small bottles of tea said to have come from the Tea Party, gathered either from participants’ clothing or from the water. If you had access to those tea samples, would there be any way to tell if that tea was actually from 1773? I would love to see those. I could probably tell whether it was machine- or hand-rolled which might negate its authenticity, but not confirm it. And a bonus that’s a little out of period: What do you think of the theory that the Earl Grey mixture of tea and bergamot was an adulteration later gussied up with a noble name? I don’t drink Earl Grey, but we tea-blenders all say it pays the mortgage. The most famous of all flavored teas was named after Charles, the 2nd Earl Grey (1764–1845) who was British Prime Minister from 1830 to 1834. The original recipe for this blend simply calls for black tea with the addition of oil of bergamot, squeezed from tiny lemons grown in the Mediterranean region. China black tea was first used as the base until English blenders began using India or Sri Lankan black teas as those gardens developed through the second half of the 1800s. The stories about the origin of the blend are many and varied. Some say the recipe was given in thanks to a British diplomat when he saved the life of mandarin—or perhaps the mandarin’s son—while in China on a mission for the Prime Minister. Some say it was Earl Grey himself who was travelling in China and saved the mandarin. Neither story has ever been substantiated. You can read more in this blog posting. Thanks to Bruce Richardson for sharing his knowledge of tea here, and at Old South and the Tea Party Ships! Readers might be able to tell that the Boston 1775 staff doesn’t care much for Earl Grey tea. Here’s an article from World Wide Words discussing the mysterious origin of that term.